When it comes to digital video advertising, a first step for many brands is to rely on one video asset—often their TV spot. While that’s a great starting point, it’s only scratching the surface. The team at 20th Century Fox in the U.K. bucked that trend, experimenting with online video assets beyond the 30-second movie trailer for the release of the feature film, “The Greatest Showman.” Since digital video ads provide an opportunity to re-engage viewers over time, they aimed to make the most of the channel with a robust mix of video creative and experimenting their way into what worked well. The innovative approach paid off in spades and changed the way they’ll plan their online video strategy for film launches moving forward. The campaign delivered awareness and consideration uplifts that were 5X stronger than those typically seen in the industry, plus powered the film to set a box office record. 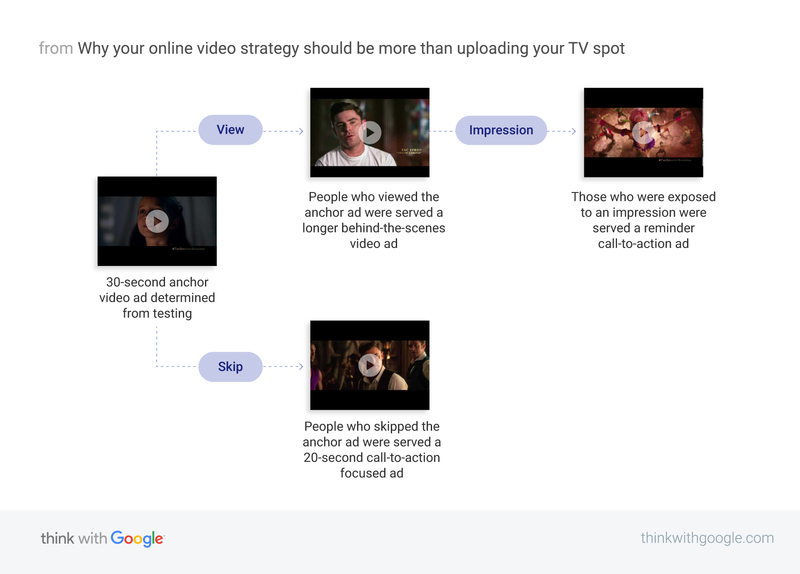 These lessons—pairing experimentation with ad sequencing—can be valuable to any brand that’s looking to experiment with online video beyond a single piece of creative like a TV commercial. Fox’s marketing goals were to drive consideration and box office impact during the month of December. As Chris Green, the studio’s U.K. marketing director explained, “Holiday time is particularly noisy. In addition to competition from other movies, you’re also contending with people’s social calendars. The key question for us was how to cut through and get noticed.” Thus, the need for an out-of-the-box approach that did more than rely on the TV commercial. But the team didn’t stop there. In fact, that was only the starting point in building out a sequence of video ads to serve viewers over time. Once the top-performing 30-second ad emerged, they deemed it to be the video campaign’s “anchor,” the initial ad people would see. From there, the team built a deliberate, data-driven sequence of ads to serve people at a later time based on how they engaged with the anchor ad. Users who skipped the anchor ad were later served a shorter 20-second edit, which focused on the romance between characters played by Zac Efron and Zendaya, a key subplot in the film. And those who chose to watch the anchor ad were served two additional ads over time: a long-form behind-the-scenes video, featuring Efron and Hugh Jackman during rigorous rehearsals, followed by a snappy 10-second ad reminding viewers to go see the movie in theaters. 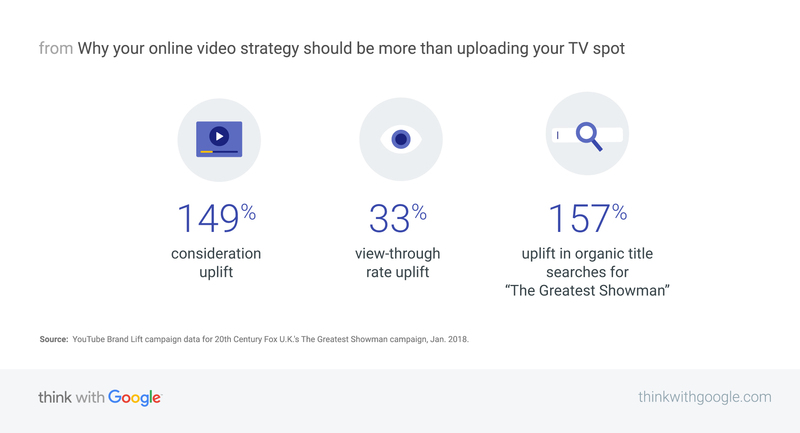 Source: YouTube Brand Lift campaign data for 20th Century Fox U.K.'s The Greatest Showman campaign, Jan. 2018.